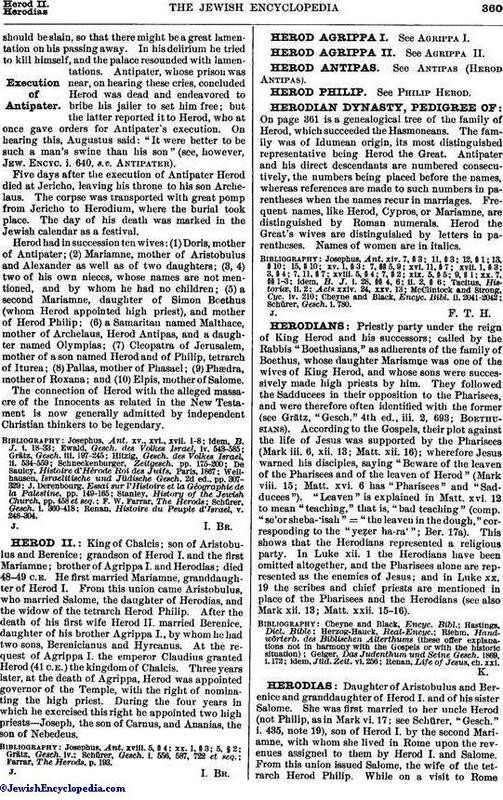 King of Chalcis; son of Aristobulus and Berenice; grandson of Herod I. and the first Mariamne; brother of Agrippa I. and Herodias; died 48-49 C.E. He first married Mariamne, granddaughter of Herod I. From this union came Aristobulus, who married Salome, the daughter of Herodias, and the widow of the tetrarch Herod Philip. After the death of his first wife Herod II. married Berenice, daughter of his brother Agrippa I., by whom he had two sons, Berenicianus and Hyrcanus. At the request of Agrippa I. the emperor Claudius granted Herod (41 C.E.) the kingdom of Chalcis. Three years later, at the death of Agrippa, Herod was appointed governor of the Temple, with the right of nominating the high priest. During the four years in which he exercised this right he appointed two high priests—Joseph, the son of Carnus, and Ananias, the son of Nebedeus. Farrar, The Herods, p. 193.